The Directing for the Screen module is for focused study and practice of narrative motion picture directing. It allows you to work through a sequence of classes that introduce you to specific needs and practices of directing for the screen. 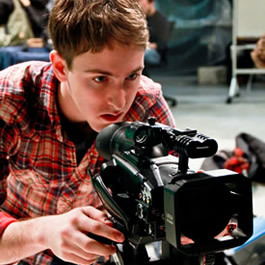 In addition to required core classes in directing (RTVF 397 sequence), you’ll choose to take two courses from a menu of production classes in order to focus on mastery of at least one key filmmaking crafts as an area of traditional aesthetic focus and directorial control in cinematic storytelling: cinematography; editing and post-production work; or directing performance. As a capstone, you will then present a portfolio with completed short films and a written evaluation of filmmaking practice while a student, encompassing aesthetic concerns, working methods, filmmaking goals, and filmmaking experiences, including curricular and extracurricular work (including internships and jobs). Thorough understanding of various modes of production involved in directing for the screen. Understand the context of your own work within screen history. Acquire a mastery of at least one chosen skill among several required to produce high quality works for the screen. Attain a self awareness about the trajectory of your own body of work. Complete at least one significant work and multiple minor works for screen and/or stage as part of a portfolio. Understand the processes necessary for continuing your work in a self-directed fashion after graduation.